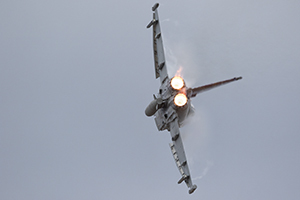 The end of September arrives and sadly the end of the air show season is in sight, with the Southport air show being held this year on the weekend of the 19th and 20th September. Southport air show is the North Wests biggest air show, and a unique sea side air show as all the action is over the extensive sands of Southport beach. Sefton Council always manages to put on an action packed line up, with this show in its 24th year having higher anticipation due to the advertised fly past display by both the Red Arrows display team and the Mighty Avro Vulcan XH558 of Vulcan To The Sky Trust. Sadly this reviewer was only available to visit on the Sunday which did not include this never to be seen again display! Never the less the Sunday line up still promised to impress with displays from a wide range of operators incorporating War birds, classic jets and several rotary winged aircraft. Waiting for the show to start the weather was looking quite ominous with lots of grey murky clouds with the odd darker cloud threatening in the distance. 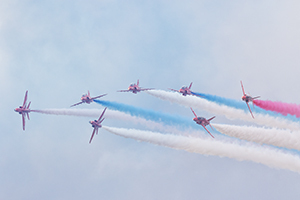 The shows flying display opened at 12.30pm in style with a rolling display from the RAF Display Team, The Red Arrows, who despite the weather conditions performed flawlessly as ever. Due next on the flying schedule was Ferocious Frankie, P-51D Mustang owned and operated by The Old Flying Machine Company based at Duxford air field. Sadly, Frankie was suffering with an electrical fault and was unable to participate. This required some slight adjustment to the flying schedule, luckily the Tigers Free fall team were able to step up to the plate and perform their display jump earlier than planned. The first of the Helicopter displays for the day began with the arrival of the Royal Navy with their Westland Sea King HAS 5 in distinctive red and grey livery.The crew expertly performed a display of their search and rescue ability by picking up a simulated casualty on the beach from the coast guard rescue boat. What made this display especially poignant was the fact that the type is soon to be retired from Search and rescue duty wit the Royal Navy as these duties are being passed across to civilian hands in the form of American company Bristows, who will carry out the duties currently carried out by the Sea King, with new Agusta airframes. 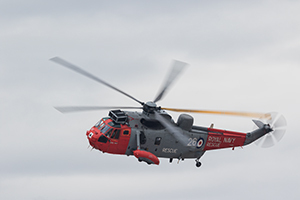 The Royal Navy Sea King Search and Rescue Display will be sadly missed across the air show circuit. Throughout the course of the show there were visits from air show regulars such as the ever popular Blades aerobatic team who made their final appearance of the air show season and performed to watching crowds with their usual vigour and high energy acrobatics as we all as other air show regulars including the Jet Provost T5, which performed in a gently controlled and elegant manner to the flight line and watchers within the VIP area of the pier which strides out into the sands of Southport Beach. 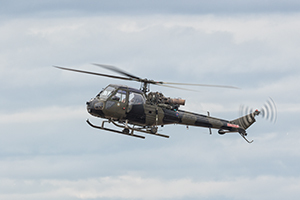 As the show reached the mid way point notable breaks and pauses in the flying schedule were apparent, possibly due to the re-arranging of the flying programme and the unfortunate cancellation of the P-51D display. 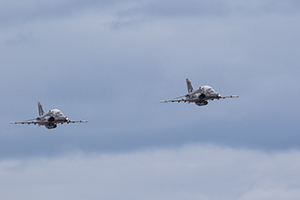 The break in action soon came to an end with the appearance of two vastly different aircraft on the horizon. 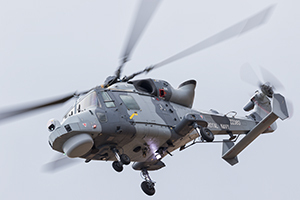 The crowds were about to be treated to sight of old meets new, in the form of the rather special formation of The Royal Navy Historic Flights Fairey Swordfish Mk I and the Royal Navy’s most up to date piece of hardware, the Agusta Westland AW159 Wildcat. 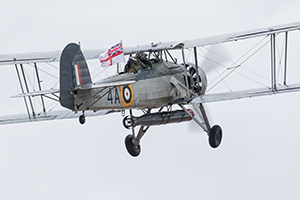 The pair did a number of fly pasts to the crowds including a touching salute from the two rear crewmen of the Swordfish. 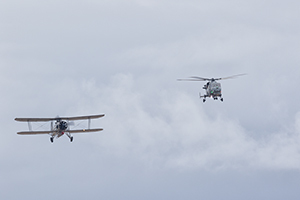 Once the flypasts were complete the pair went their separate ways to perform their solo displays, which included a spirited performance from the solo Wildcat, showing the audience the manoeuvrability and agility afforded to such a capable aircraft. The next part of the flying schedule was another flying duo, this time in the guise of Spitfire PL965, a PR Mk XI, fastest of the Merlin powered Spitfires owned and operated by Peter Tiechman as part of his Hangar 11 Collection out of North Weald, and Hawker Hurricane I P2921 based out of the Biggin Hill Heritage Hangar. 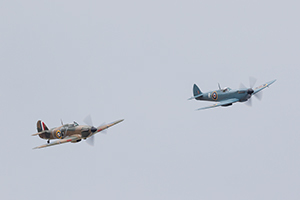 The pair arrived to the flying arena in view positioned side by side and performed what could be looked upon as Southport Airshows tribute to the commemoration of the 75th Anniversary of the Battle of Britain. The pair soon finished their duo display and broke off and went their seperate ways. 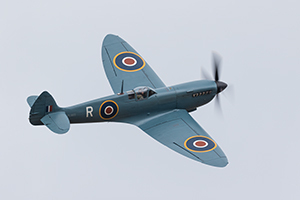 The Hangar 11 PR XI Spitfire returned to perform a solo display under the masterful control of Peter Tiechman, who always puts on a beautiful display exampling the power and grace afforded to the Spitfire. Todays display was no exception with the Hangar 11 boss giving some fantastic top side shots affording anyone with a camera the opportunity to get a great cockpit shot. Next to fly above the sands of Southport was what I can only describe as the hidden gem of the show. 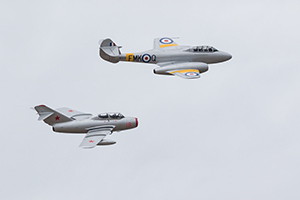 An un-scheduled flypast display from the Classic Air Force’s Gloster Meteor T7 and a Polish built Mig 15UTI of the Norwegian Air Force Historical Squadron, which has been doing a tour of the UK air show circuit this year. The display that consisted of several flypasts including some stunning top side passes was a real rare sight to behold, one I am sure that will not be seen for some time to come. The two silver air frames glided through the air almost with a whispering quietness. Once the duo had completed their display they parted company to conduct their solo displays. The Meteor, not seen at the Southport Air Show since 2012, handed out some fabulous photographic opportunities for all those out there with a camera, giving clear views into the post war jet age cockpit. Once the Meteor had completed its programmed slot in the flying schedule the Norwegian owned Mig returned to complete its turn in the flying display. 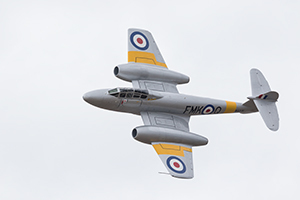 The 1952 built dual seat jet with its gleaming silver cigar shaped fuselage and swept wing design performed a graceful routine including some impressive climbs to height before sweeping back down to the display line. The penultimate display of the day saw the final display of the season by the Royal Air Force’s Hawk T.2 Role Demo from Team Ninja, including a densely packed pyrotechnic display on the beach. The pair based at RAF Valley, swept in from the left hand side of the crowd line and continued down to the VIP area of the pier before climbing to up and out to see to return to display centre. The display consisted of several beat ups of the beach line with pyrotechnic cannon fire popping up from the sands and a simulated RPG strike attempt on the two glistening black jets, accompanied with flares launched from the ground to represent the aggressor fire. The final act of the day arrived, the Royal Air Force’s very own weather maker, the Eurofighter Typhoon FGR4, sporting a Ruby Red tail to commemorate 29 Squadrons Centenary. 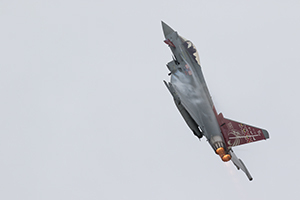 The cutting edge fighter displayed its incredible agility and power with lots of after burner action glowing up as ‘Full Carrots’ against the grey skies, and incredible power climbs before diving back in at incredibly steep angles of attack. Due to the moisture rich air present on the Sefton Coast the crowd were treated to lots of vapour action as the moisture in the air was ripped from the wings during the High G manoeuvres. The display, another last for this season definitely didn’t disappoint and closed the flying in style. The team behind Southport Air Show have pulled off another fantastic two day event of which other Air Shows should take note of. 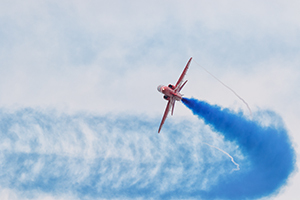 Next year sees the 25th year of the Southport Air Show and I for one cannot wait to see what they come up with to mark their Silver Anniversary, with dates already announced as the 10th and 11th September, it is clear that the plans are already underway!